Not to be confused with 9 (2009 animated film). Nine is a 2009 romantic musical drama film directed and produced by Rob Marshall and written by Michael Tolkin and Anthony Minghella. The film is an adaptation of the 1982 musical of the same name, which in turn is based on Federico Fellini's semi-autobiographical 1963 film 8½. In addition to songs from the stage musical, all written by Maury Yeston, the film has three original songs, also written by Yeston. The ensemble principal cast consists of Daniel Day-Lewis, Marion Cotillard, Penélope Cruz, Judi Dench, Fergie, Kate Hudson, Nicole Kidman, and Sophia Loren. The film premiered in London, opened the 6th annual Dubai International Film Festival on December 9, 2009 and was released in the United States on December 18, 2009, in New York City and Los Angeles, with a wide release on December 25, 2009. Though a critical and commercial failure, Nine was nominated for four Academy Awards: Best Supporting Actress (Penélope Cruz), Best Art Direction (John Myhre (AD), Gordon Sim (SD)), Best Costume Design (Colleen Atwood) and Best Original Song ("Take It All", music and lyrics by Maury Yeston). Guido Contini is a gifted Italian filmmaker in 1965 at the famous Cinecittà movie studios in Rome. At the age of fifty he has developed writer's block and surrealistically summons all of the women in his life, alive and dead, to help him recapture inspiration, as dozens of female dancers and the film's leading ladies appear in his mind: Claudia Jenssen, his star actress; his wife Luisa; his mistress Carla; his costume designer and confidant Lilli; his beloved Mamma; Stephanie, an American fashion journalist from Vogue; and Saraghina, a prostitute from his childhood; ("Overture Delle Donne"). He avoids any clear answers when questioned by reporters about his new movie, because he doesn't have an idea for one. Guido creates an elaborate fantasy ("Guido's Song"), where he explains that he wishes to have the naiveté of youth yet the wisdom of age. Escaping to a Spa Hotel on the Italian coast, he receives a phone call from Carla, his mistress ("A Call from the Vatican") seducing him as he listens on the other end. Later, she arrives at the spa, expecting to share his suite, but is upset to learn that she's staying in a shabby pensione by the train station. Meanwhile, Guido meets with Lilli, his costume designer, and begs for inspiration, confessing he has no script. Lilli urges him to use his film to entertain, inspired by the Folies Bergère, where she 'learnt her art' ("Folies Bergères"). Then Guido remembers Saraghina, a prostitute who danced for him and his boyhood schoolmates on a beach, teaching them the joy of life's sensual and sexual pleasures ("Be Italian"). Young Guido is caught by his school teachers/priests and punished by his principal while his ashamed mother reluctantly watches. Back at the Spa, at dinner, he's happily surprised to see his wife Luisa. He embraces her and wishes her a happy birthday. Luisa, deeply unhappy, sings of the life of compromise she's made, abandoning her acting career to be at Guido's side in supporting his art ("My Husband Makes Movies"). She then notices Carla entering the restaurant and storms out immediately, Guido following. Luisa ignores him and leaves and, when he returns to the restaurant and sees Carla, he is furious. Guido demands Carla to leave, which leaves her heartbroken. Later, unable to pacify Luisa in their hotel room, Guido seeks out Stephanie in the hotel's bar, who describes her love for his movies though clearly from the point of view of an ignorant fashion editor ("Cinema Italiano"). She takes him to her room but, watching her undress, Guido realizes how much he cares for and needs his wife and seems to come to his senses. Returning to Luisa he promises that he's finished with cheating. As she embraces him, the phone rings and he's called away to help Carla, who has overdosed on pills in a suicide attempt. It becomes impossible for Guido to juggle all the women and contradictions in his life. He stays with Carla until her husband Luigi arrives, then returns to the hotel to find that Luisa has abandoned him, and the crew has returned to Rome to begin filming. Distraught, he has a vision of his mother singing him a lullaby when he was young ("Guarda La Luna"). Later, in Rome, he phones Luisa from the studio and begs her to come to view screen tests the next evening. When his leading lady, Claudia, arrives and senses there is no written script, she and Guido go for a drive. Guido confesses that there is indeed no script, but he needs her to inspire one. She asks him what he wants the film to be about and his description closely resembles his own ordeal: a man lost and in love with so many women. Claudia explains that she loves him but he seems to be a man who does not know how to love ("Unusual Way"). When Guido returns to review the screen tests, Luisa also arrives and is devastated to see a clip of an actress in a scene drawn from a private memory she and Guido shared years ago. It is the last straw for her, to see him exploiting her private life so publicly before the world. In an angry and imaginary public striptease she leaves Guido for good ("Take It All"). Utterly abandoned by all those whom he has selfishly exploited, Guido finally comes to terms with the truth ("I Can’t Make This Movie"), realizing that he's lost everything and everyone and has nothing with which to make a movie. Admitting that there never was a movie, he has the set destroyed before leaving Rome. Two years later, Guido is in a café in Anguillara with Lilli and sees an advertisement for a play starring Luisa. He asks about Luisa and Lilli tells him that she's not going be to be the middle-man for them. When she asks if he will ever make a movie again, Guido answers that the only thing he would want to make would be a movie about a man trying to win back his wife. Daniel Day-Lewis as Guido Contini – based on Federico Fellini. Marion Cotillard as Luisa Acari Contini – based on Giulietta Masina, Fellini's wife. Penélope Cruz as Carla Albanese – based on Anna Giovannini, Fellini's mistress. Nicole Kidman as Claudia Jenssen – based on movie star Anita Ekberg. 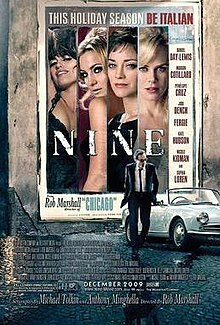 On April 12, 2007, Variety announced Rob Marshall would direct a feature film adaptation of Nine for The Weinstein Company. Marshall had previously directed Chicago for the Weinsteins while they were still at Miramax. The film was co-produced by Marshall's own production company, Lucamar Productions. In 2008, a short "teaser" for the film was featured in an episode of the Food Network show, Barefoot Contessa, with the host, Ina Garten, making breakfast and lunch for her friends, producers John DeLuca and Rob Marshall, as they edited their new film, at the end being a "preview" of their film for the host to see in appreciation. In December 2009, the film contracted the soap operas One Life to Live and General Hospital for advertising purposes. The former featured two of the characters watching one of the film's trailers on the Internet on a YouTube-esque website, and there were subtle setting alterations performed for the latter, including movie posters on the walls of various public places. On April 4, 2008, it was reported that Nicole Kidman had replaced Catherine Zeta-Jones in the role of Claudia Jenssen, who turned down the role when director Marshall refused to expand the role for the film. The film was Kidman's first big-screen musical since Moulin Rouge! After Catherine Zeta-Jones's departure, Anne Hathaway was auditioned for the role, but was turned down. On May 14, 2008, Variety reported Daniel Day-Lewis was in talks to star in the film as Guido Contini, the film's lead character, after Javier Bardem dropped out due to exhaustion. Later, it was reported Day-Lewis sent producers a video of him singing and shocked them with his voice. On May 19, 2008, People reported the actor had landed the role. Antonio Banderas, who had starred in the Broadway revival, said he was "disappointed" at not being cast, but that he thought the trailer to the film looked great and only wished the "best" for everyone involved. Variety also reported that Penélope Cruz auditioned for the role of Claudia, but was cast as Carla, and that Marion Cotillard auditioned for Lili, but was cast as Luisa, and that Kate Hudson had also been cast in a role created specifically for her which had not been featured in the Broadway show. On July 18, 2008, People reported Fergie had been cast as Saraghina. Katie Holmes auditioned for the role of Carla Albanese and Demi Moore auditioned for the role of Luisa Contini, but both failed to win those roles. Barbra Streisand was considered for the role of Lilli, but the role went to Judi Dench. Day-Lewis already knew some Italian (although he admitted not studying for the role at Q&A session for Screen Actors Guild) he frequently spoke the language in and out of character. According to music supervisor Matt Sullivan, "One day during shooting at London's Shepperton Studios, "Rob and I got called into Daniel's dressing room, which was designed as a 1960s film director's office," says Sullivan. 'He's smoking a cigarette, in full outfit and in character, and he's telling us how he would like to see this number that he's performing. And he's talking to us as Guido Contini. It was a really surreal experience.' " Rehearsals for the film began in August 2008, the songs were then subsequently recorded in late September and filming commenced in October at Shepperton Studios, London. The film had been set to shoot in Toronto, though once Day-Lewis signed on, the production then moved to London. Further filming took place in Italy (in the villages of Anzio and Sutri), and at Cinecittà Film Studios. Nine's schedule required Kidman to begin rehearsals just four weeks after giving birth to her daughter. The teaser trailer for the film was released on May 14, 2009. (*) Songs not featured in the film, bonus tracks. Guarda La Luna (Look at the Moon), a lullaby sung by Sophia Loren as Mamma. Yeston tailored this song specifically for Loren's voice, though he based the melody on the song Waltz from Nine from the Broadway score. Cinema Italiano, a number which Kate Hudson performs as Stephanie. This has "a retro feel" with "elements of '60s pop" that demonstrate how important Italian cinema was in that era and to illustrate the shallowness and vanity of Stephanie. Take It All, originally written as a trio for Claudia, Carla, and Luisa, but, just before shooting, rearranged as a solo for Luisa, according to music supervisor Matt Sullivan. These are songs that appeared in the musical, but were not included in the film or in the soundtrack. The film soundtrack peaked at number twenty-six on the Billboard 200. It also peaked at number three on the Polish Albums Chart and at number nine on the Greek Albums Chart. The film received generally mixed reviews, although Day-Lewis, Cotillard, Cruz, and Fergie's performances were praised by critics. Review aggregate Rotten Tomatoes reports that 40% of critics have given the film a positive review based on 205 reviews, with an average score of 5.13/10. The critical consensus is: "It has a game, great-looking cast, led by the always worthwhile Daniel Day-Lewis, but Rob Marshall's Nine is chaotic and curiously distant." On Metacritic, the film has a rating of 49/100, indicating "mixed or average reviews". The film was also a box office bomb, as it grossed just $19 million domestically and just below $54 million worldwide, against an $80 million budget. Despite less than favorable reception, it received four nominations for the 82nd Academy Awards and received other notable awards and nominations. Nine was released on DVD and Blu-ray May 4, 2010. The DVD featured an audio commentary by director Rob Marshall and producer John DeLuca, 8 featurettes, and 3 music videos. The Blu-ray Disc included all the DVD extras including another featurette and a Screen Actors Guild Q&A. ^ "Nine (12A)". British Board of Film Classification. December 11, 2009. Retrieved December 23, 2016. ^ a b "Nine (2009) Box Office". Box Office Mojo. Retrieved February 14, 2010. ^ "Dubai International Film Festival". Dubai International Film Festival. ^ Hernandez, Ernio (January 23, 2008). "Work Resumes on Script for Rob Marshall's Nine Film". Playbill News. Playbill. Retrieved August 7, 2008. ^ "Kidman and Dench Rumored To Star In 'Nine'". broadwayworld.com. Wisdom Digital Media. April 4, 2008. Retrieved August 7, 2008. ^ Fleming, Michael (May 14, 2008). "Daniel Day-Lewis eyes 'Nine' role". Variety Los Angeles. Variety. Retrieved August 7, 2008. ^ Silverman, Stephen M (May 19, 2008). "Daniel Day-Lewis Lands Nine Role". People. Time Inc. Retrieved August 7, 2008. ^ "Antonio Banderas and Laura Linney; Interview for 'The Other Man'". Youtube.com. September 3, 2009. Retrieved June 4, 2010. ^ a b c "Oscar winners abound in 'Nine' – Entertainment News, Music for Screens: Summer '09, Media". Variety. August 24, 2009. Retrieved January 12, 2010. ^ Tapper, Christina (July 30, 2008). "Fergie to Play a Prostitute in the Movie Musical Nine". People. Time Inc. Retrieved August 7, 2008. ^ "Katie Holmes and Demi Moore Audition for 'Nine' Film 2007/07/01". Broadwayworld.com. July 1, 2007. Retrieved January 12, 2010. ^ Bamigboye, Baz (June 26, 2008). "BAZ BAMIGBOYE on Gillian Anderson, Nicole Kidman, Roman Polanski and much more... | Mail Online". London: Dailymail.co.uk. Retrieved January 12, 2010. ^ "Nicole Kidman and Daniel Day-Lewis take a spin in the Eternal City, dodging the Sixties-style paparazzi | Mail Online". London: Dailymail.co.uk. January 29, 2009. Retrieved January 12, 2010. ^ ""Nine" Soundtrack Will Hit Stores in December". Playbill.com. October 26, 2009. Archived from the original on April 7, 2012. Retrieved January 12, 2010. ^ "Venerdì 22 Gennaio 2010" (in Italian). EarOne. Retrieved April 8, 2019. ^ "OLiS – Official Retail Sales Chart". ZPAV. Retrieved February 22, 2010. ^ "Top 50 Ξένων Aλμπουμ" (in Greek). IFPI Greece. Retrieved January 29, 2010. ^ "Nine". Rotten Tomatoes. Flixter. Retrieved June 11, 2010. ^ "Nine (US – DVD R1 / BD RA) in News > Releases at DVDActive". DVDActive. Retrieved March 13, 2010.